That's what some people are reporting in the Hurricane Rita blog. 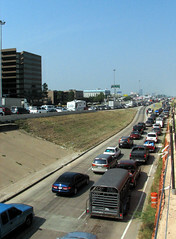 After sitting in traffic for 14 hours or more, cars are running out of gas and overheating. Portseye reports, "the typical travel speed on any of the evacuation routes is roughly 1-3 mph." The Galveston Causeway is normally closed to bike traffic, but that didn't stop Steve Wygant. He's riding his bike out of Galveston to Houston. As he rides by cars stuck in bumper-to-bumper traffic, he says, "I'll be waving at them, not them at me." Cycling Dude has discovered that biking away from a disaster isn't always obvious, even to bicyclists. Huntsville and Lufkin are both about a hundred miles from Houston, which is bicycling distance for a strong cyclist. For a family with children and maybe pets, the bike is a little less practical, but sitting in traffic for two days in stifling heat and running out of gas doesn't sound practical either.